Citrix is providing as with several tools to check the Citrix environment you are maintaining. One of these tools is called MedEvac. Citrix created MedEvac to test if on the server the XML and IMA services are available. Let's found out if the tool is addition to your toolbox. MedEvac does not need to be installed. It is was single executable which can be run from a Windows XP system or a Windows 2003 server. Logically you need to start the executable with a user account which has access to the Terminal Servers. Also MedEvac does not need any configuration. Every time you use the tool you need to specify which servers you would like to test and which Published Application should be used for the test. If you specify the domain name the tool enumerates all the Citrix servers within that domain. But you can also add the server manually on name or IP-address. The tool does not remember these information, but you can save the list of Citrix server in a specific MedEvac file (*.msl), but you can easily open it with for example Notepad. Besides the servers you would like to run the test to you also need to specify the Published Application. With the Published Application a test will be run for example the least loaded server. Determines least loaded server from the zone Data Collector using the XML service of the server specified in the "Servers" field. Retrieves a ticket from the server specified in the "Servers" field. Check the "health" of the TermService (Terminal Server services). 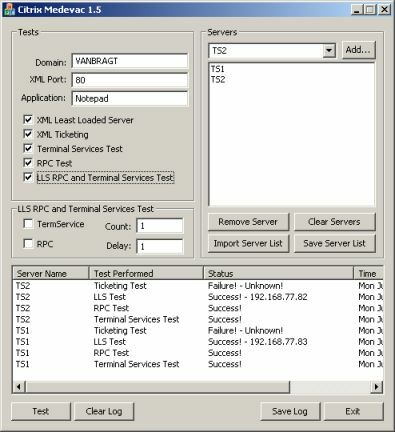 This test will check RPC health on the server specified in the "Servers" field (done by trying to access the Application Log in the event viewer). Combination of the checks Least loaded server, Terminal Services and RPC test, but than only executed on the least loaded server. This test can be executed with an counter for the amount of tests. Now the servers and tests are checked the real test can begin, simple by pushing the test button. After a while (depending how many servers you selected) the results of the test will be presented within the tool. Actually you got a success or a failure message, sometimes with a small explanation why the test failed. I did not found the presented information gives me more information than other tools or ways to check the health of the environment. MedEvac delivers you only with basic information about the status of the IMA and XML services on your Citrix servers. If an error occurs during testing only basic information is displayed. Most information the test displays can also be gathered in another way with tools are simple troubleshooting tasks. The advantage of MedEvac is that the tests are combined in one tool, so you get the information quicker. Also the option to execute the LLS RPC and Terminal Services Test with a counter is nice one if you have a lot Citrix Servers in your environment. What I miss in the tools is in depth failure message together with hints to check what could cause the failure. Also the test should be run manually every time. It would be nice if the tool could be scheduled to do the tests within a defined time interval. MedEvac can be downloaded from the Citrix support site (MyCitrix or CDN account required).